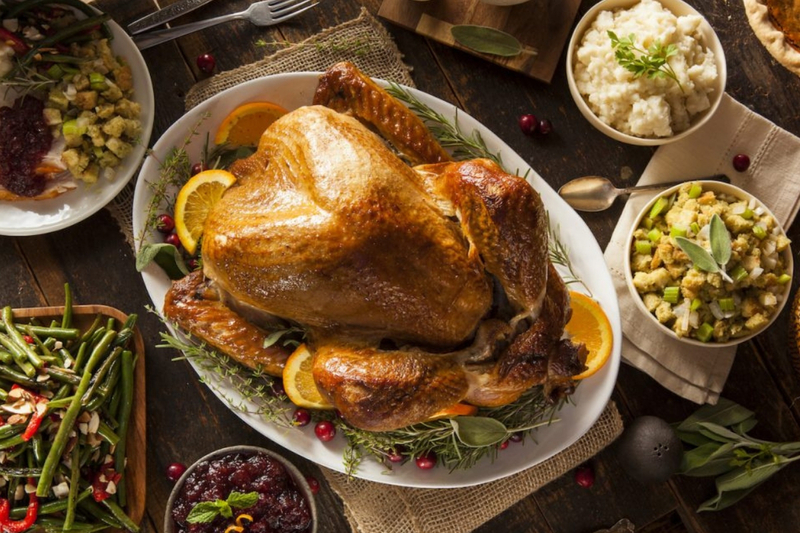 Thanksgiving falls on Thursday, November 22 this year, so whether you’re an expat who’s far from home or you just have a craving for some turkey before Christmas arrives, there are plenty of options for feasting and celebrating this heartwarming holiday. Below, some of the best spots to celebrate with all the trimmings, from cosy taverns to the city’s prime meat houses, plus options to have the best birds delivered straight to your door. The American steakhouse has been offering some of the best slices of beef since opening last year, but aside from steaks, Wolfgang’s Steakhouse is also offering a Thanksgiving dinner menu featuring succulent sous vide turkey and more. It all starts with a ricotta cheese salad and a classic style pumpkin soup, before a choice of dry-aged New York sirloin or turkey as your main. It finishes with a satisfying slice of traditional pecan pie for a taste of the holidays. Thanksgiving dinner menu $628 (+10%) per person is available from from 22 to 24 November. Recently unveiling their night time concept KONG, Breast & Beast are offering more than just sandwiches and now have dinner menus, sharing bites and cocktails available. This includes Thanksgiving in which a real feast is on offer. Diners can stuff their faces with eggplant caprese, crispy suckling pig, lap cheung mac & cheese and salad to share, as well as the star of the show — 24 hour brined slow cooked turkey breast. Topped off with a bourbon spiked pecan pie and choice of Ovaltine egg nog or mulled wine. Thanksgiving Feast menu HK$788 for two persons (min. 2 pax) is available 15 to 24 November. Celebrate Thanksgiving with La Famiglia at Italian-American restaurant Posto Pubblico this year. The gourmet menu is jam packed with authentic dishes, so you can have your turkey and your tiramisu. Homemade burrata and veal meatballs kick off the meal before the garlic butter roasted turkey comes to the table with stuffing, potatoes and vegetable sides. There is also the option of a two-hour free flow drinks package which comes with continuous pours of Henriot Champagne, Wild Turkey Old Fashioned, red or white wine, and Peroni Beer. Thanksgiving dinner menu HK$439 (+10%) per person; free-flow drinks package HK$248 (+10%) per person is available 21-22 November from 6-11pm. There’s something about this tavern and its dark wooden interior that already feels festive, while the hearty American fare also feeds into the holiday feeling for Thanksgiving. An optional Seafood Platter (HK$50 per person) with oysters, crab legs, black cod ceviche and old bay shrimp add a touch of luxury to the meal, but the real decision making comes with choosing between the garlic butter roasted turkey or southern fried turkey. And it wouldn’t truly be American without the warm skillet s’mores or a rich apple crumble for dessert. Free-flow drink packages are also available with wine, craft beers and spirit mixers. Thanksgiving dinner menu HK$548 (+10%) per person; free-flow drinks package HK$198-308 (+10%) per person is available 20-26 November. Based on seasonal recipes by celebrity chef Jamie Oliver, the Thanksgiving menus at Jamie’s Italian includes lunch and dinner menus for both individual or family sharing sets. For those not needing a whole turkey, the 3-course set menu is perfectly portioned with tomato bruschetta, roasted pumpkin panzerotti, a turkey plate with sliced roast turkey and sides, as well as dessert. The sharing style is made for a group of six to eight people and includes a whole 6kg turkey as well as cold cuts to start, the ‘fish in a bag’ seafood dish, and fall favourites like the pumpkin and pecan crumble to finish. Thanksgiving individual set menu for lunch HK$198 (+10%) and dinner HK$228 (+10%) per person; group set menu for 6-8 people HK$1,950 (+10%) is available 12-25 November. The new American dining concept located in L Place in Central presents two-storeys; a hunting lodge-style restaurant upstairs and a sleek cocktail bar with outdoor garden terrace downstairs. The Thanksgiving menu is a huge festive feast designed for sharing, filled with the autumnal fruits of harvest. Highlights include a potted turkey leg confit, glazed ham steak, boar stuffing, candied yams, pumpkin pie and of course, the whole roasted turkey with cranberry sauce. Sharing cocktails are also available in jars of raspberry cobbler (+HK$368) and barrel boulevardier (+HK$458). Thanksgiving Sharing Frenzy menu HK$588 (+10%) per person (min. 4 pax) is available 22-25 November. Two indulgent menus are available at meat specialists Porterhouse including one made in true Thanksgiving spirit for sharing and a 5-course set meal for more intimate occasions. To share, dishes such as pumpkin risotto carnaroli, grilled global seafood platter and a whole roasted organic turkey with mashed potatoes, crispy bacon, brussel sprouts and more is offered. While the set dinner includes dishes like USDA prime beef tartare, pumpkin pennette lisce, turkey leg roll and pumpkin & pecan pie. Free-flow drink packages are also available to add and include Prosecco or Champagne, in addition to wine, beers and cocktails. The Thanksgiving weekend brunch (24-25 November) will also feature carvings of turkey and pies too. Thanksgiving Sharing Feast menu HK$888 (+10%) per person (min. 8 pax); Thanksgiving Set Dinner Menu HK$588 (+10%) per person; Fabulous Flow drinks package HK$250 per person; Fantastic Flow drinks package HK$480 per person available 19-25 November. For those who prefer to celebrate at home, Thanksgiving can be just as stress and mess-free with the whole meal delivered straight to your door. This one is our own favourite, but we think that you can’t go too wrong with the Mandarin Oriental’s turkey options. Prepared by the hotel’s culinary team, the feast is guaranteed to be of five-star quality and impressive for all types of celebrations. Whether you opt for the roast turkey or glazed ham, you’ll be pleased to know that they come with servings of sides, such as stuffing, pumpkin wedges, mashed potatoes, cranberry sauce, corn on the cob, cornbread and giblet gravy. The Family Feast includes trimmings and condiments, plus two bottles of organic apple cider and a choice of pumpkin pie or salted butter pecan pie. From HK$2,928 (7kg turkey and sides) to HK$4,028 for the Family Feast (10kg turkey, trimmings and condiments) available to order until 19 November. Delivery charges apply. Orders must be placed 72 hours in advance. Click here for more information or contact The Mandarin Cake Shop; +852 2825 4008.